One of the best shrubs for providing rich color contrast in the garden. 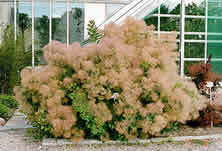 Easy, fast growing & reliable, “Smoke Bush” can reach 12’-15’ high & wide but is easily trimmed into a shrub or small tree specimen. The rich, brownish-purple foliage is yummy & makes surrounding plants really stand out. Dramatic clouds of small flowers are borne in Summer. 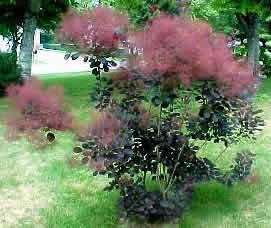 “Smoke Bush” likes sun to part shade & well drained soil. Resistant to oak root fungus & considered one of the fire-safe plants. Note: the plants are from seed, so you may get some interesting variations.